Today in robotic clocks, we've got a robot that tells you the time by manually drawing and erasing it every minute. 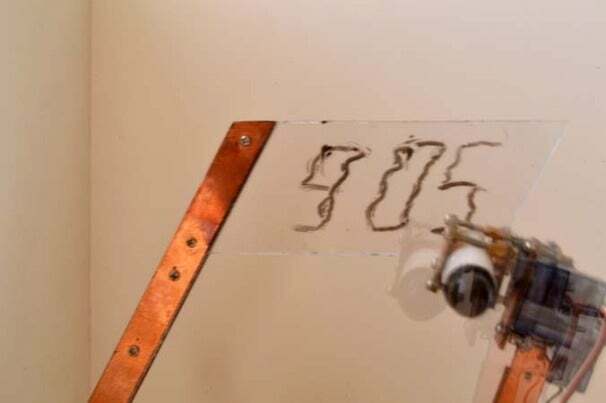 The "doodle clock" by Ekaggrat Singh Kalsi operates a robotic arm (using Arduino of course) along with a felt tip marker to draw the time on a dry-erase board. Each minute, the doodle clock uses its Arduino to read the time and control the four servos (two in the arm and one each for the pen and eraser) that help it write the time. As for the clock's distinctive handwriting, Ekaggrat says that the tiny motors don’t have pinpoint accuracy, which requires the clock to draw over each number a few times to ensure its readability. But the robot's coolest feature is what it does after it finishes writing out the time: After withdrawing the marker from the dry erase board, the doodle clock waits until the minute is over and then intelligently erases and re-writes only the digits that need updating so that it doesn't have to re-draw everything all over again. A robot drawing clocks is cool and all, but what if it could do that...IN SPACE? !